Budgeting for Border Collies, What’s The Bottom Line? When considering the cost of using Border Collies for Canada goose control, you need to first consider how much this method will actually save you in other areas. #9. Anti-acids for when you are sick to death of the complaints! Geese sharing golf course with a silhouette dog decoy. #1. You can cut the man hours spent in clean up or break up goose droppings with harrows and chains by 90%. #2. You can cut the amount of fuel used in clean up or break up goose droppings with harrows and chains by 90%. #3. Your need for chemicals will drop. #4. You can cut the amount of droppings to be hauled away by 90%. #5. Your mowers won’t be getting gummed up all the time. #6. Your walk ways, Club house, Pro shop, restrooms will be staying clean longer. #7. No more messing with do-dads that don’t really work. Sound like a dream? Well, it works. After sixteen years of Canada goose control in the Denver Metro area of Colorado, I am still amazed at how well this method works, and keeps working. People who have spent years doing the “goose yuck two step” are delighted to see us arrive—they stop to watch us work and want to meet the dogs. They have clean walk ways, greens and sports fields. 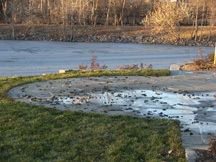 In the end, there is no way to clean up the goose droppings as cleanly and economically as simply not having the geese on your turf and walkways in the first place! The true magic of working Border Collies is not that they come onto a property and scare the geese away forever and forever. The magic is that the consistent use of a goose trained Border Collie will continue to work. Chemicals wash off, mylar balloons and streamers become a part of the scenery. Canada geese smugly bip out of the way when we chase them or throw things at them. But the geese have no choice but to respond to what is truly a predator. A predator they know can catch them. 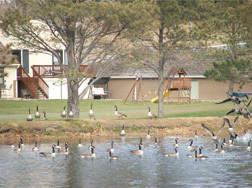 The geese cannot get used to or learn to ignore a living breathing predator, that stares at them and approaches them. This is a predator that follows them into places that used to be safe. The instinct of survival is overpowering. Fortunately, nobody ever told the Canada geese how safe these dogs really are. A Border Collie’s body language looks like a hunter—we psych the geese into thinking there are dangerous predators on your property! 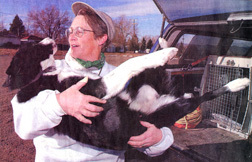 They go away naturally—and the geese can not habituate to a moving, interacting Border Collie. 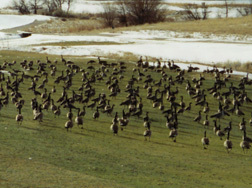 The single most effective method of Canada goose control on a specific property is through the use of specially trained Border Collies to haze the geese away. Border Collies are quiet workers, goose friendly and environmentally safe.courses, schools, parks, cemeteries, business/ office parks and private properties.